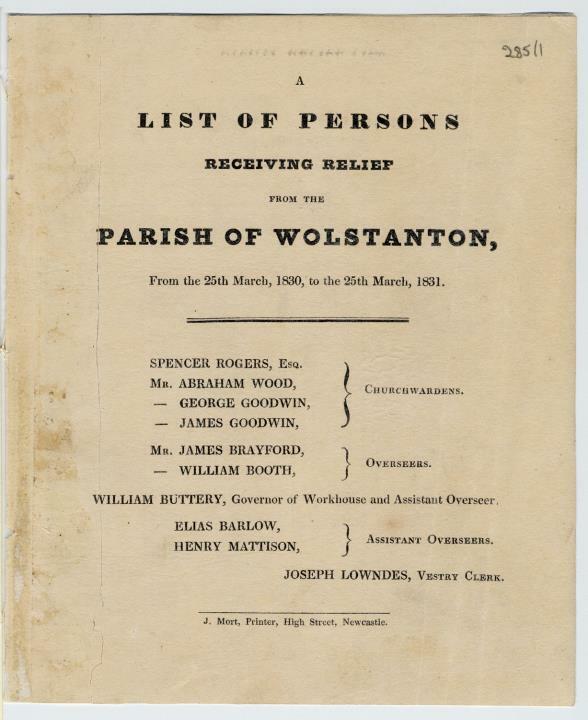 Description:Family historians may relish this revealing booklet, which reports on the poverty suffered by the residents of Wolstanton, in Newcastle-under-Lyme, during 1830-1. It was commissioned by a parish committee made up of church wardens, overseers, and clerks. Together, they were responsible for running the workhouse, which was at the centre of efforts to relieve poverty, and was paid for by the parish itself. Pottery manufacturer Enoch Wood kept this document and it is now among the collections at Stoke-on-Trent Museums. It was printed by Mort's of Newcastle.